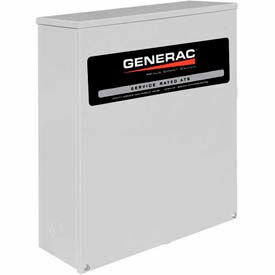 Generac® Transfer Switches and Accessories Are Designed For Use With Single Phase Generators 60kw And Below. Generac® Transfer Switches and Accessories have 200 amp open transition switches for single phase in non-service rated configurations. Transfer switch is encased in an aluminum NEMA/UL 35 casing to provide long lasting durability and protection. The digital management technology (DLM) allows for increased load volume. Available accessories include Transfer Switch, Smart Switch, Module Starter Kit, Watt-Switched Neutral Kit, Wayy Generator Cord and more. Several models available for use with 10-16 circuits 7.5kW outdoor, indoor applications, 11kW Standby generator, 12-16 circuits and more. AJC® Brand Replacement Generator Batteries Provide Power Instantly To Protect Generators Against Damage From Surges Or Dips. AJC Brand Replacement Generator Batteries are available for Briggs & Stratton, Generac or Steele brand generators. Batteries are made with Absorbed Glass Mat (AGM Battery) technology and come charged, sealed, and ready for immediate installation in . 12 volt batteries with F1 or NB terminals. 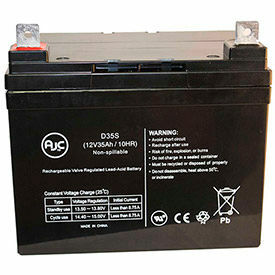 Amp range 7Ah to 33Ah. Please note that you must reuse your existing cabling and hardware. These are replacement batteries only. These products are not authorized by nor affiliated with any generator brand name. Inverter And Portable Generator Accessories Are Used For Applications Including Residential, Outdoor, Emergency Services, And More. Inverter and portable generator accessories are made of high quality materials for long lasting durability and dependability. 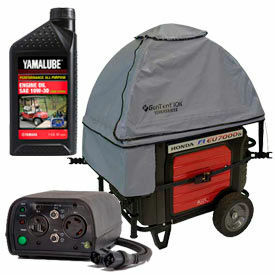 Accessories provide additional generator equipment including covers, parallel kits, oil, and more. Covers feature a UV-resistant material for generator protection and corrosion resistance. Parallel kits allow efficient dual generator compatibility for increased power. Oil ensures generator operation efficiency for longevity. Color finishes are Black and Blue. Dimensions vary per model.